I’ve been blogging about the goings on in Foggy Bottom for the last 4-5 years. I thought I’m no longer susceptible to shock and awe, but as it turns out, I still am. In your statement on January 30 (“Talking Points for Explaining Chaos in Iraq”) you use the Department of State seal. In addition to any violation of 3 FAM 4170 by this statement, use of the seal violates 2 FAM 152 (below). As your supervisor, I instruct you to remove the seal from this statement and to refrain from using it on any unofficial public statements. This email came from an office I’ve renamed, the Office of Policy Discoordination and Media Affairs. Now,the interesting part is that the email cites two violations but only contains one instruction for the removal of the seal, and not/not the removal of the blog post. a. Department of State personnel are authorized to affix replicas and reproductions of Department Seals to appropriate documents, certifications, and other materials for all official purposes, consistent with this section. b. Department of State seals or reproductions thereof may not be used for unofficial purposes by any person, and may not be used by any nongovernment person or entity, without the express approval of the Department. The chief of mission or designee must immediately notify the Office of the Inspector General, Office of Investigations (OIG/INV) when misuse of an official seal is determined. e. Wrongful use of the official seals of the Department of State could subject the individual or entity to the provisions of 18 U.S.C 1017, which provides penalties for the wrongful use of an official seal, or 18 U.S.C. 506, which provides penalties for forgery or fraudulent making of a Department seal, and to other provisions of law, as applicable. I wonder if this is official harassment by another name or if State has followed the regs and formally notified the Office of the Inspector General, Office of Investigations (OIG/INV) for the misuse of the seal? Or is it that the somebodies are compiling an email load to demonstrate to the IG a preponderance of evidence of FAM-related law breaking here. Just so I get this straight — 1) The US taxpayers are paying an FSO to stay away from work while he is suspended for writing a book that makes people looks bad. The suspended FSO, without his security clearance is technically consigned to cleaning latrines, except that is one job you cannot actually perform by telecommuting no matter what the work requirement statement says. 2) The US taxpayers are paying another employee, a Deputy Director no less, and who knows how many more, for monitoring the suspended FSO’s website, research the infractions in the FAM and write emails such as the one complaining about the misuse of the department’s seal. 3) The US taxpayers are paying these employees for the enviable chore of writing a weekly report of the various online infractions committed and email it to the suspended FSO, just so he knows and everyone knows that this is a job everyone at State takes seriously. Nothing is too small or too unimportant to get into this weekly report. By end of the year, the weekly report would make a nice thick book. Now what I’m really wondering is this — how many employees at the State Department has blog monitoring and weekly written reports on private Foreign Service blogs included in their work requirement statements (WRS)? U.S. State Department seals, the U.S. Great Seal, logos, and other official insignia may not be used or reproduced without written permission. Use of the Great Seal of the United States is governed by Public Law 91-651, Title 18 of the United States Code. This is a criminal statute with penal provisions, prohibiting certain uses of the Great Seal that would convey or reasonably be calculated to convey a false impression of sponsorship or approval by the Government of the United States or any department, agency, or instrumentality thereof. 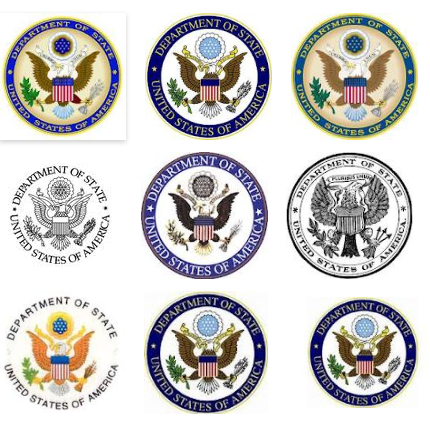 Although the Secretary of State is custodian of the Seal, the Department of State has no authority to grant or withhold permission for use of reproductions, facsimiles, or likenesses of the Seal, or any part thereof. It depends on the circumstances in each case whether the particular use of the Seal would be improper and, as such, it is a function of the Department of Justice to determine whether any particular use violates the Statute. Consequently, the Department of State’s policy has been to discourage use of the Great Seal, except when used for governmental or educational purposes, and the Department does not provide artwork for its use other than for official State Department material. Note that the prohibition on the use of the State Department seal does not apply to employees of the U.S. Government, foreign or domestic but to unofficial use by any person. Presumably that includes everyone, even those online. And corporations, for they, too are people. This one has USG seals available online for sale, including State Department seals. This one is an item on DIY State Department Cable Decoder, posted with a seal. Then there is this entry in forbes.com on An Outbreak of Bureaucratic Idiocy, which includes a State Department seal. The Foundation for Defense of Democracies has this posting, US State Department Adds Mullah Sangeen to Terrorist List; it also includes the State Department seal. It is everywhere online, even in Wikipedia, where the image is considered to be in “public domain” as a work of a USG employee. So – you’re going to tell me that the preceding sites which all contains the U.S. State Department seal have the “express approval of the Department” to use it? No? Does that mean, they too, must have received similar emails with instruction to “stop the misuse of the Department of State seal?” No? Well, then this is just so outrageously confusing. We sent an email to Mr. Holder’s DOJ inquiring what happens if a person use the seal in a private blog without permission. And where do you request a permit to use it, anyways? And if all those newspapers, magazines, web blogs all had to get permission when they put up the seal online? I have yet to receive a response from Justice. If I get a response, you’ll get an update. And by the way, just between us — you don’t need a GS 15 Deputy Director to do this kind of work. Seriously, you can outsource this to India. Or if you want to help the economy – you can absolutely insource this to me. I have perfect tea time manners and I’ll be diplomatic. I swear.